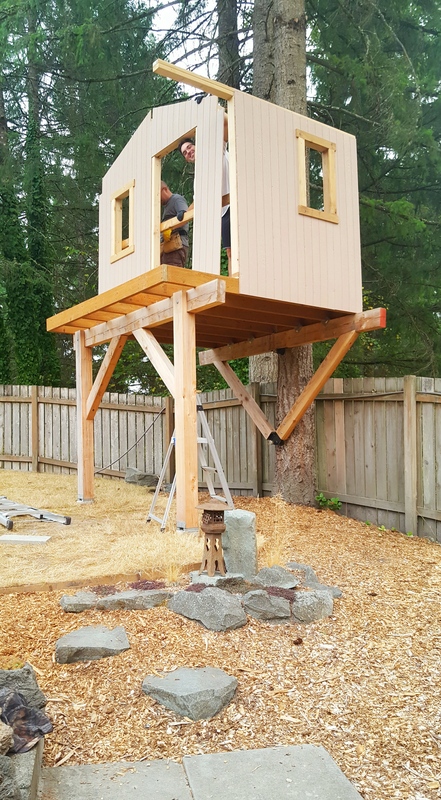 This summer has been the summer of the tree house! Mark has spent so much time, all winter basically, drawing up plan after plan for Sky’s tree house. He’s adjusted, updated, and changed the plans to make it safe and assure it looks like it fits in with our house/yard. 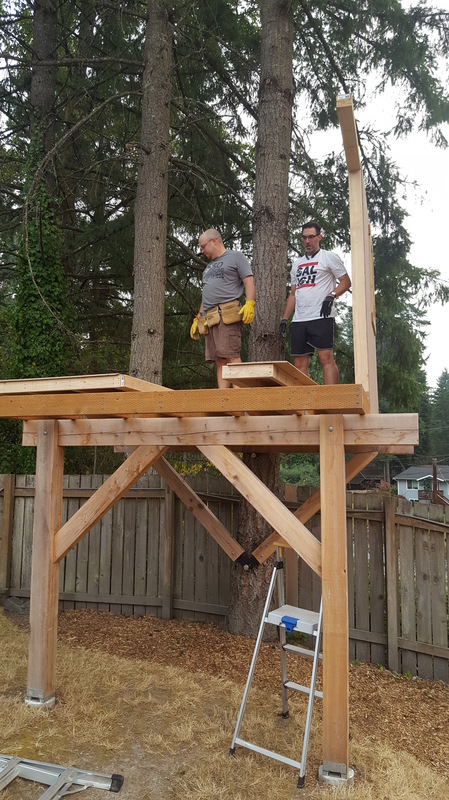 Tree House builders! 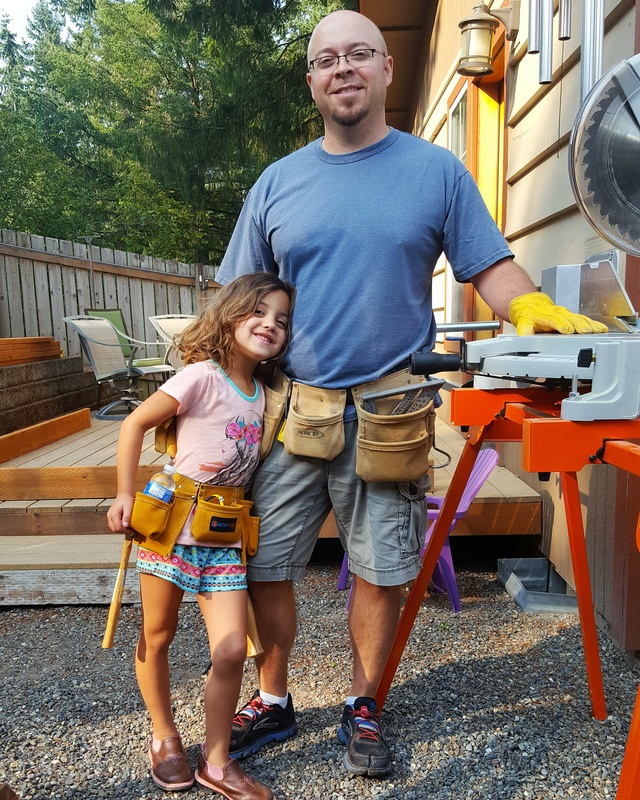 I love her little tool belt! I mean the anchor bolt that supports the whole darn thing was a $500 bolt and it’s massive! Safety first for sure! He’s trying to make sure it will be fun and usable until she moves out. Once she’s done playing restaurant and hosting tree house sleep overs, it will be perfect for sipping sweet tea or hot chocolate while reading a good book, or just having her own space to retreat to. Shoot, I may escape up there for some quiet time and a glass of wine! Hahaha…that’s only funny because my vertigo is so bad that I can hardly stand being up there. I’m hopeful that once it’s done, and the perm ladder is installed it’ll be a little better for me. 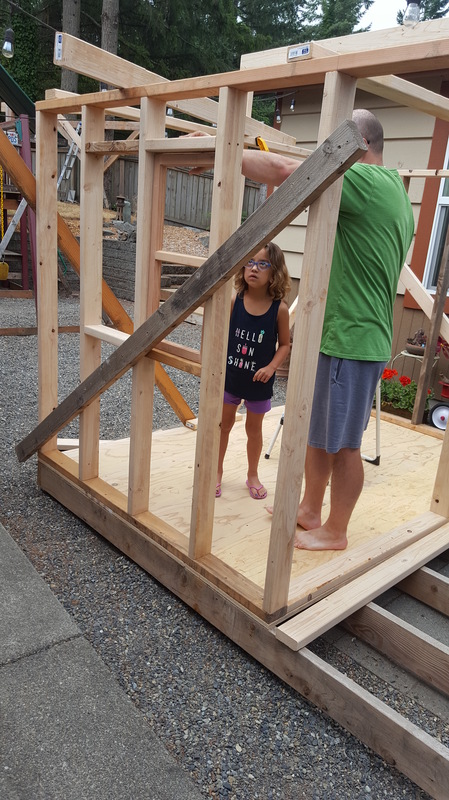 It’s been a multi-step process building the platforms up in the tree, then bringing the platform down to our patio, and building the tree house down on the patio, then taking it apart and taking it piece by piece up into the tree and putting it back together up there. The only thing left is roofing, door & windows, railing, ladder, and paint. We control the outside paint as we want it to look cohesive with the house, but Sky has totally freedom on the inside, and I’m predicting it will be rainbow walls with lot’s of pink and purple. Thankfully Josh was willing to help get the walls up into the tree. You can see that massive anchor bolt in the tree, since we only have one tree to work with that bolt supports most the weight while protecting the health of the tree at the same time. It has the roof framing (is that what it’s called?) Basically ready for the actual roofing to go up, just have to wait for the rain to go away so Mark can work safely. So exciting to see it up in the tree, and Sky’s constantly asking to go up there to check out the progress. Once it’s all done I’ll share final pictures.